Back in April this year Toby had a stay at the Children's Hospital in Brighton to have his tonsils and adenoids removed to cure his sleep apnoea. I was really worried about it as the day approached and didn't know how best to prepare him for the upcoming operation. One day we received a mailing from the hospital containing a brilliant information pack which included a booklet called 'Monkey has an operation'. This brilliantly simple and informative booklet had been written by a mum to prepare her own family for her little daughter's major surgery. The photographs were taken at The Royal Alexandria Children's Hospital in Brighton and featured all the things that Toby would see when we arrived and what would happen, right down to the electric quad bike he got to drive to the anaesthetic room. It helped to prepare both boys and us parents for what was coming up and when a thing is known it becomes less scary. It also helped that we just happened to have a similar-looking monkey toy at home, so the boys could act out Monkey's trip to hospital. Having benefited so much ourselves from this resource I jumped at the chance to help spread the word about it when I saw that bloggers were wanted to review new products in the range. 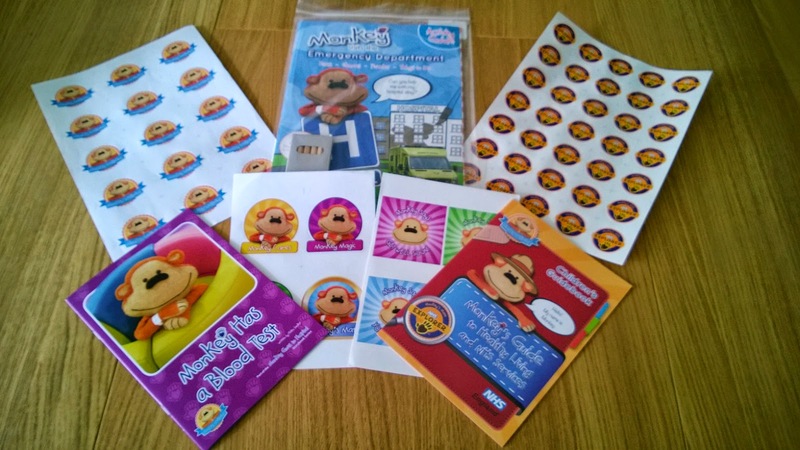 This morning we received a pack which included stickers, the booklet 'Monkey has a blood test', a children's guide to healthy living, and an activity pack 'Monkey visits the emergency department'. The resources are really well thought out with clear pictures that toddlers will recognise even if they don't quite follow you reading out the written description of what will happen. 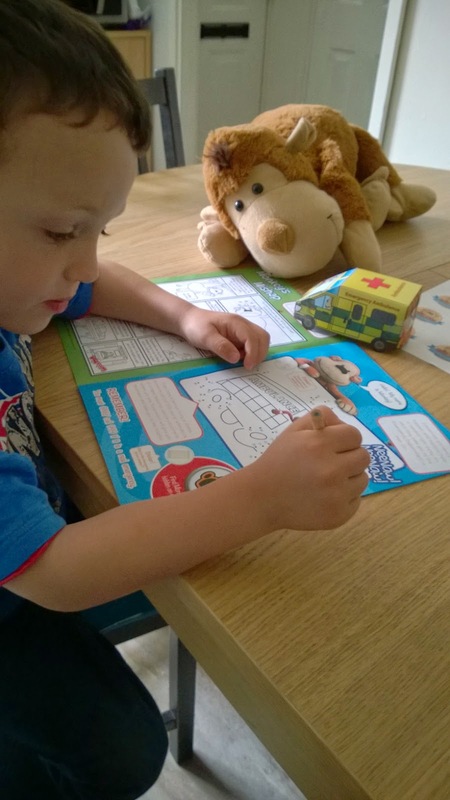 Four year old Ollie is just about the right age to really get the full benefit of the guides and was able to complete all the fun and informative activities in the emergency department booklet. Best of all there were lots of stickers with the emergency department pack, plus pencils and a card ambulance toy. The resources represent really good value, especially the two books 'Monkey has an operation' and 'Monkey has a blood test' which are less than £3 each. We were very fortunate that Brighton sent us the operation book, but if we had friends and family attending all the other hospitals that don't send them out I would 100% recommend that they get hold of a copy before they go.